This is a once-in-a-lifetime experience for most people that climaxes in the fascinating mysterious Lost City of the Incas: Machu Picchu . The Inca Trail combines spectacular landscapes, lush cloud forest, sub-tropical jungle and a mixture of Inca ruins. On this journey we use premium hotels and whilst on the trek itself we also offer a more varied range of meals and a higher weight limit that allows you to take more clothes and personal items to make your trek as comfortable as possible. Our trip is designed to maximise the time spent at Machu Picchu, and a dawn tour of the ruins allows us to appreciate the site before the crowds of day trippers and other trekkers arrive. (Alternative remote Moonstone Trek available when Inca Trail Permits have sold out). The overnight group flights to Cuzco (via Sao Paulo and Lima) depart London this evening. Set amidst hills in the altiplano, the Imperial City of the Incas, Cuzco was the geographic, cultural and political centre of a vast empire which, at its peak, stretched from present day Quito in Ecuador to Santiago in Chile. After the Spanish conquistadores invaded the city they started building on top of the Incan structures, resulting in unique architecture, a fusion of the Incan and Spanish colonial styles. The group flights usually arrive in the mid-afternoon, giving time to wander the cobbled streets admiring the old houses, visiting its interesting museums, churches and pre-Columbian buildings, such as Qorikancha – the Sun Temple, or to sit in a café, enjoying a coca-tea watching locals in their traditional dress go about their business. There will be a briefing in the evening. Today we visit the magnificent Sacred Valley of the Incas and the incredible ruins at Pisac before continuing on to Ollantaytambo, where we spend the night. The Sacred Valley, which runs along the Urubamba River near Cuzco, is the true heartland of Incan culture and tradition, which is still strong today. The high-Andean scenery is dotted with old towns and villages dating back to pre-Columbian times. The ruins of the Citadel at Pisac guarded a road from the lowlands and gives way to a picturesque landscape of terraces carved into the solid rock itself. Whilst the Inca ruins at Ollantaytambo give you a sense of the scale of what is to come as huge stone terraces scale the valley sides. This was the royal estate of Inca Emperor Pachacuti as well as being of religious and defensive significance. 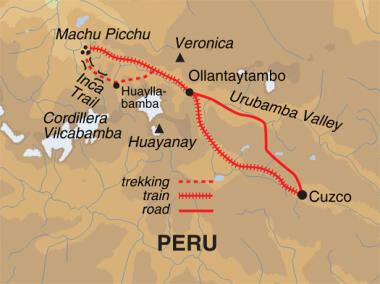 The Classic Inca Trail is a tangential branch part of a 45,000km road network linking the whole empire to Cuzco. It was built in the 15th Century to reach Machu Picchu but was abandoned soon after the Spanish conquest. American adventurer, Hiram Bingham travelled along the trail when he came across Machu Picchu in 1911. The trail opened to the public in 1970. We leave Ollantaytambo this morning and take a short drive (approx. 45 minutes) to the start of the Inca Trail at Piscacucho, commonly known as Km82. The trail runs alongside the Vilcanota River beneath the impressive snowcapped Nevado Veronica, passing through cactus gardens and fields of corn until we reach the enormous Inca ruins of Llactapata, where we continue up a side valley to camp near the hamlet of Huayllabamba. This is the longest and most strenuous day of the trek. A long climb takes us first through an area of cloud forest to the meadows of Llulluchapampa, then over the Warmihuañusca (Dead Woman’s) Pass, at 4,215m the highest point on the trek. After quite a long, steep descent we camp in the scenic valley of the Pacamayo River (3,600m). We start the day with an easier climb which takes us past the ruins of Runquracay and over the Runquracay Pass (3,930m). From now on the Inca Trail becomes a clearly defined path made of flat boulders. We pass the ruins of Sayajmarca and suddenly enter rainforest; at one point the Trail passes through an Inca tunnel. 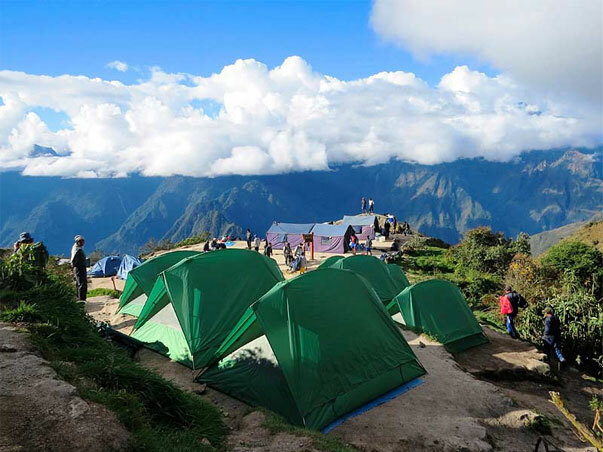 We camp on the ridge above the Inca site of Phuyupatamarca (3,680m) to benefit from the views of sunset and sunrise. From the ridge we embark on the infamous Inca steps: a two kilometre stone staircase taking us rapidly downhill amid a panorama of overwhelming immensity, with the peaks of the Vilcabamba range above, and the river thousands of metres below. After visiting the attractive ruins of Wiñay Wayna, we have an undulating walk through cloud forest high above the river to Inti Punku, the Sun Gate. From here we get our first full sight of Machu Picchu itself, with Huayna Picchu rising behind. Traditionally busy with groups of trekkers clamouring for photos, we plan our arrival at Inti Punku later in the day so we can enjoy unobstructed views of the magnificent ruins. Our trekking permits allow us one entry into the site, which we use for our dawn tour tomorrow, but anyone wishing to visit the citadel on both days can purchase an additional entry ticket today for approx. US$50 – your tour leader will assist with this. Passing around the ruins we descend to the river and Aguas Calientes for a well-earned rest, a comfortable hotel room and hot shower. We return to Machu Picchu early for a tour of the ruins at their quietest and most evocative. This hour is when the ruins are quietest as the trekkers finishing that day haven’t arrived yet and the day trippers are still on their way from Cuzco. Machu Picchu was built in the 15th century, most likely as an estate for the emperor Pachacuti. The site was abandoned in the 16th century with the conquest of the Spanish and was forgotten by all but the people who lived nearby. In 1911, whilst searching for the lost city Vitcos, Hiram Bingham travelled down the Urubamba asking local farmers if they knew of any ruins nearby. This is how he was taken to Machu Picchu, completely covered by jungle at this stage. The site has since been cleared and its location atop a mountain makes it one of the most awe-inspiring sights in the world. After free time to explore individually, we return to the village and board the Belmond Hiram Bingham train in the afternoon or early evening (a packed lunch is provided today). The route follows the rapids of the Urubamba River, enters the Sacred Valley and climbs onto the altiplano, eventually arriving into Cuzco. Today has been left free to relax after the trek or explore Cuzco further. There are a number of optional excursions available which your tour leader can arrange for you. If you still have the energy you could chose to mountain bike in the Sacred Valley, taking in a 30-35km ride through Moray, Maras and the small village of Pichingoto. Alternatively you could try your hand at paddle boarding on Lake Piuray near the town of Chinchero. Or, if feeling more subdued, take it easy and watch the world go by in Cuzco’s Plaza de Armas. Those travelling on the group flights will be taken to Cuzco airport this morning for your domestic flight to Lima where you will connect with your overnight flight to London via Sao Paulo. The group flights arrive in London today. On this trip we follow a similar itinerary to our popular ‘Inca Trail’ trip (trip code TPT) but with upgraded hotels, an included Sacred Valley tour, included sleeping bag hire, and with a hotel night at Machu Picchu replacing a night’s camping. While on the trek itself, we also offer a more varied range of meals and a higher personal weight limit than on our standard Inca Trail itineraries, allowing you to take more clothes and personal items to make your trek as comfortable as possible. Our trip is designed to maximise the time spent at Machu Picchu, and a dawn tour of the ruins allows us to appreciate the site before the crowds of day trippers and other trekkers arrive. (Alternative remote Moonstone Trek available when Inca Trail Permits have sold out). Named after the American academic who rediscovered Machu Picchu for the world in 1911, and operated by Peru Rail, the Hiram Bingham luxury train transports guests to the great Inca ruins and back to an era of old-world elegance and romance. We use a variety of comfortable hotels in Cuzco, Ollantaytambo and in Aguas Calientes (depending on departure date) – we can provide a hotel list for your departure date upon request. All of the properties are centrally located, with en-suite bathrooms and breakfast facilities and many feature Colonial architecture. The trek itself is on a full-service camping basis. We stay in organised campsites jointly administered by the National Institute of Culture and the National Parks Service. We use three-man tents for those on a twin share basis and two-man tents for singles. The tents are relatively spacious with enough room inside for the kitbags. We provide thermarest-type mats which are about 4cm thick when inflated and 3-4 season sleeping bags. We also have a dining tent complete with table and folding chairs, and toilet tents for use during lunch stops as well as during the evenings. A hot drink and a bowl of warm water (to wash with) will be brought to your tent each morning. A limited number of single supplements (hotel and tent) are available on this trip from £175; please request upon booking.